I have started racing at the tender age of 29. I bought a pitbike - Stomp 140cc and I am entered in a racing league consisting of 21 riders. Having never ridden such a small bike before, I am finding it a challenge, so being the only rookie this year (everyone else has done at least one full season) I am proud to say I am currently 14th in the championship out of 21. I'm the only lady racing this year, and indeed the first girl to enter this championship. I'm not doing it for fame or glory, just to see if I'm any good. I try to colour co-ordinate my kit, wear a feminine helmet and I am the only rider in white. I finished the season 10th out of 21 riders last year. Signed up for a second season, and after the first round am sitting a healthy 10th place. 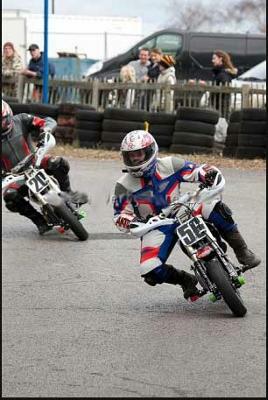 I must say I am amazingly happy with my progress, as I am now improving my lap times and actually overtaking some guys. But I still chicken out at the first corner in case of a pile up, having won last year's trophy for Most Spectacular Crash. Racing of any kind is fun! I have never seen that type of racing before, with small bikes. I raced motocross in the late 1970's and because there weren't many girls, we often rode with the novice boys. Loads of fun - but boys don't like being beaten by girls! You are brave, girl! I admire your sense of adventure. Your self esteem must be through the roof, mine sure would be. YOU ARE GOOD!